Lately I’ve been sharing stories about how my cats have inspired me to create art, and usually this art has them as the subject or includes them somehow. But in this case my cats inspired me to other subjects and a new way of creating my art. I’ve also been talking a good bit about loss having recently lost Kelly and Cookie, and just passed Pet Memorial Sunday, but it’s not the sadness of the loss I dwell upon, but the gifts that come from that loss. 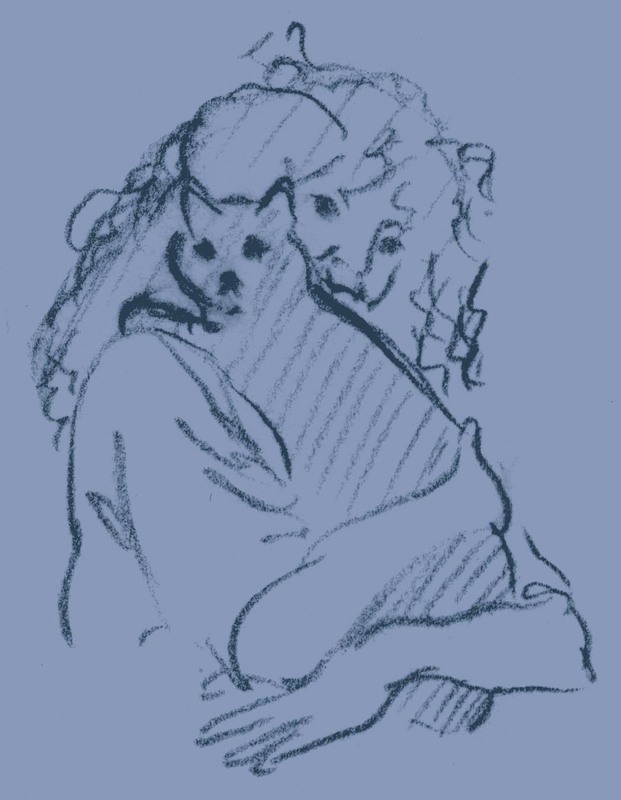 I owe as much of my career as an artist to the losses of my cats as to the living with them. The passing of a loved one or a change leaves an open spot in our lives which eventually we must fill in order to heal. In the autumn of 1996 I lost two of my cats two weeks apart, but in resolving the grief of their loss I discovered my love for painting my familiar local landscapes en plein air and also began painting still lifes and I know in no small part their spirits led me to this. Looking at this artwork brings them to mind because this was what I did to heal. Self-portrait with Kublai, charcoal pencil on paper. I had been watching my beloved Kublai simply fade away in the grip of some undiagnosed autoimmune disease while I took a crash course in caring for a pet with a chronic illness along with learning about homeopathic and naturopathic options from flower essences to homeopathic remedies to raw feeding. He’d taught me an important lesson in communication with him and while I felt helpless that I couldn’t heal him, just having that constant thread of non-verbal communication between us made me feel very deeply connected to him each moment. 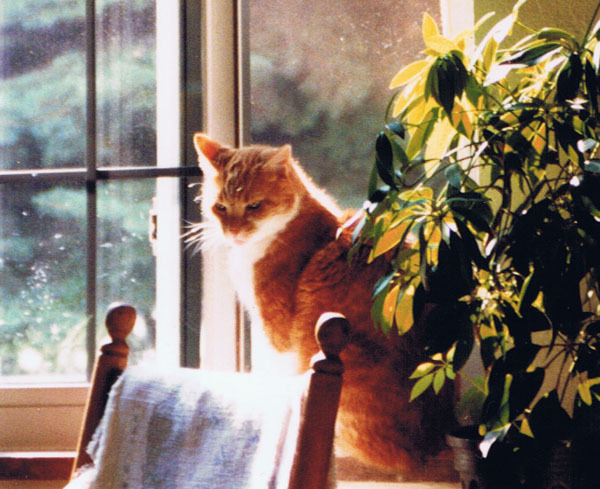 He and I experienced his end stages with awareness, and this was a great comfort to me as I had approached my first feline loss with no awareness whatsoever. But it wasn’t to turn out quite the way it seemed it would. I noticed during a meal that my orange boy, Allegro, was eager to eat but did not. My veterinarian explained a number of things it could be, most likely a tooth infection, and I felt along his jaw and found a fairly large lump but nothing in his mouth. Suspecting a possible infection in a salivary gland, she instructed me to begin antibiotics and we made an appointment for the following week if there was no improvement. He began eating a little but the lump stayed. My veterinarian is a house call veterinarian and so when she arrived to see Allegro she could also see Kublai, who was at that point down from 12 pounds to about 5 and we knew he couldn’t continue like this for much longer. So Tuesday, September 17, she came to see Allegro and diagnosed him with lymphoma so advanced there was no possible treatment except doses of prednisone given as injections along with subcutaneous fluids as I was giving them to Kublai, and that only for some degree of comfort until he was ready to go. Cats do hide things well, but I had been so focused on Kublai I hadn’t even noticed other possible symptoms. Poor innocent Allegro, I had felt so confident that at least I was keeping Kublai comfortable, but at the cost of my orange boy it felt selfish and I felt like a failure. Two mornings later, Thursday, September 19, I knew Kublai was in distress but he told me in that way he’d taught me to listen that I should go to work. I left and came back a few minutes later, unable to leave him. He let me know it was okay, I should go, and I left him curled on his blanket in the spare bedroom. I oddly felt my spirits lift as I drove to work. When I came home at the end of the day I immediately felt he wasn’t in the house and wondered how he might have gotten out, though he was famous for escaping. But I found him upstairs nearly where I’d left him, and apparently he had died soon after I left the house, probably when I felt the lifting of my own spirit, connected to his, as his spirit left his body behind. No wonder he had urged me to go—for some reason he didn’t want me present, and he was eager to let go and be free. I’ve just passed this anniversary, the season is changing, and it’s what brought this story to mind. Trying to grieve Kublai, I turned to Allegro, and while he improved somewhat he was eating less and less and even I could feel the growths in his abdomen. He and I enjoyed warm autumn days outdoors as I planted the daffodils I still see each spring and he hunted little voles in my flower beds. Our time was compressed but entirely sweet. Exactly two weeks later, October 3, Allegro was weak and dazed-looking when I came home from work. I called my veterinarian and explained the symptoms, and after noticing his pale gums and paw pads she said he was bleeding internally and she would get there as soon as she could, but that wouldn’t be until later. I had one last huge dose of prednisone to give him for comfort, but he failed quickly and was no longer breathing when she arrived, though his heart would not stop, sweet and loving kitty that he was. Well, having a greater amount of awareness and being highly involved in their care helped immensely with my grief after their loss as a good part of it with Bootsie had been the sudden shock of it all. But now I had the task of grieving both of them, and I had been so deep into physically caring for them, especially Kublai for nearly a year, that not only had I lost them in my life, but I was still in critical care mode with no subject to treat. And worst of all, I loved my home, but I hated coming back to it after work. Without Kublai, who had always felt like my life partner, I felt I’d lost my anchor, and the house felt so horribly empty I couldn’t stand it. That first weekend was so quiet that I went to the library and spent Saturday afternoon there, looking for more books to read and reacquainting myself with Marjorie Williams’ The Velveteen Rabbit. I had a few paintings planned, but just could not bring myself to work on the paintings of my cats I had wanted to paint. Up to that point I had pretty much painted only my cats with a few other pieces here and there done in my studio as I worked on learning watercolor, but working from life had not been successful. All the other artists I knew were painting the landscape, especially working en plein air, and I envied how they rendered the fields and hills I knew so well and which were my other refuge. I’d been wanting to find the time to work on painting from life rather than from photos and decided that the next weekend, weather depending, I’d make the plunge. If I failed, no one but me would know. I had some places in mind along my drive to work as I took back roads just for the view. On a brilliant autumn morning decorated with small clumps of clouds and wisps along the horizon. I drove to the places I had in mind letting the mix of warm autumn colors and the varied textures of nature soothe my heart. 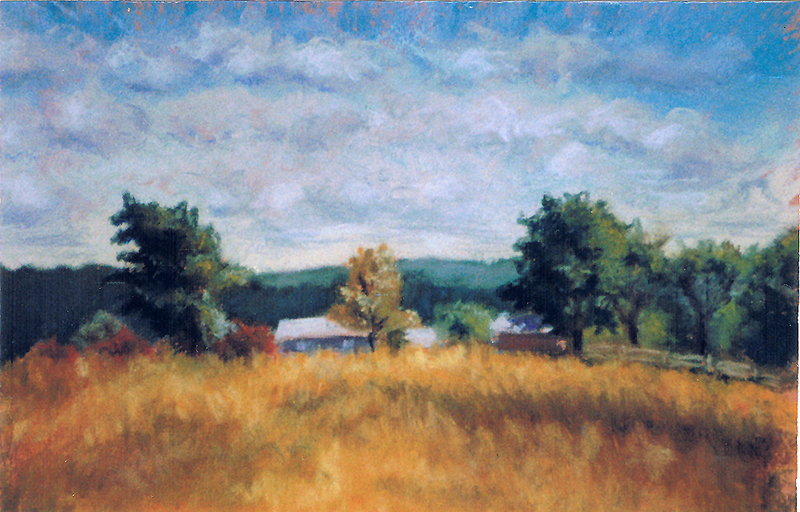 I set up an easel near a field I’d always loved and did a quick pastel sketch called “Hilltop Farm”, and the action was like a good meal, enjoyable, fulfilling, exciting and certainly one I wanted to repeat. I realized this was the spot along the road where I’d felt the sudden lift of my spirits as I drove to work on the morning Kublai died, mentioned above. On the way to and from work the next week I excitedly sought places I could set up again and the following Saturday drove to another spot I loved to visit generally, a long graceful slope which had been a pasture on a huge farm, high atop a ridge with lots of sunlight and sky and wind, fields of waving grasses mixed with autumn wildflowers and one narrow road. I spent the rest of the afternoon there, until the sun’s angle changed so much I couldn’t reasonably work any longer. I took a photo, packed up, stopped to pick a big bunch of asters, ironweed and goldenrod and went home. I’d been gently thinking of the boys all through the session, remembering them fondly though they had no connection with the place at all. Spending several hours on a piece of artwork and in the outdoors had allowed me to let in the loss. I sailed in the door with my drawing and sang hello to Sally, Stanley and Moses, Fawn and Nikka, Cookie and Sophie, and I could tell by their reaction they knew what had transpired as they greeted me in return with their own songs, tails waving. I waded through them and set my painting on the easel in the corner as they jumped up onto the windowsill and furniture around me. I was simply so happy, and realized I was crying. Finally, I could begin to really let go. I found a ceramic vase I’d had since college and placed it on the picnic table on the deck where Kublai and I had spent so much time as the year progressed—we even ate meals out there together. I placed my wildflowers in the vase and looked at them shining in the warm autumn sun and somehow the cycle seemed complete. That night I worked “Harvest of Color” just from memory (photos were on film in those days), and the next day pretty much finished it, thinking over the process of en plein air painting and working on landscapes. I also kept admiring how lovely my wildflowers looked perfectly framed through the back door. As the day went on I had another idea, and set up my easel on the deck. I fussed around with a sketch of the flowers until finally I began to feel my visualizing fade in and I realized there had been no sun shining on them before, but now it had moved around to an angle that shone in under the deck roof. I painted as much of “Autumn Harvest” as I could until the light changed too much. Later I finished it from photos I had taken while working. Kublai and I had spent a good bit of time at that picnic table, and every time I look at that painting I remember. The next weekend I visited a friend I worked with on her family’s farm, enjoyed my visit with her and our walk around the fields, met all the cows and carefully studied all the barn cats in case any wanted to come home with me, then settled in a spot where I’d seen one round bale left behind from the previous year. The sky had grown overcast but I like when that happens after a sunny day, kind of drawing things to a close so you can sit quietly and review the day. It was by now early November, a storm had passed through and most of the foliage was gone leaving only the burnished oak leaves clinging to the tall trees in a grove at the edge of a pasture. My pace had quickened with the experience of the previous en plein air sessions, and I painted this rather quickly. I felt the boys visit me here too, less so than the day I’d painted “Harvest of Colors”, but by then they’d visited a few times in the house as well and I was managing to accept their loss. Weekends weren’t good for painting outdoors until the following spring, but I had felt a change in me and in how I worked as an artist. Those outdoor sessions had quickened my own pace through the necessity of capturing the moment, loosened my strokes as I was looking at a constantly changing image instead of a still photo. These things carried over into my portraiture, forever changing how I finished them by putting away the photos near the end and simply visualizing the scene and how it would look in life and doing my best to capture that moment. The following winter into spring I painted two of what I consider my best, and turning points for me in portraiture, “After Dinner Nap” and “A Warm Bath”. 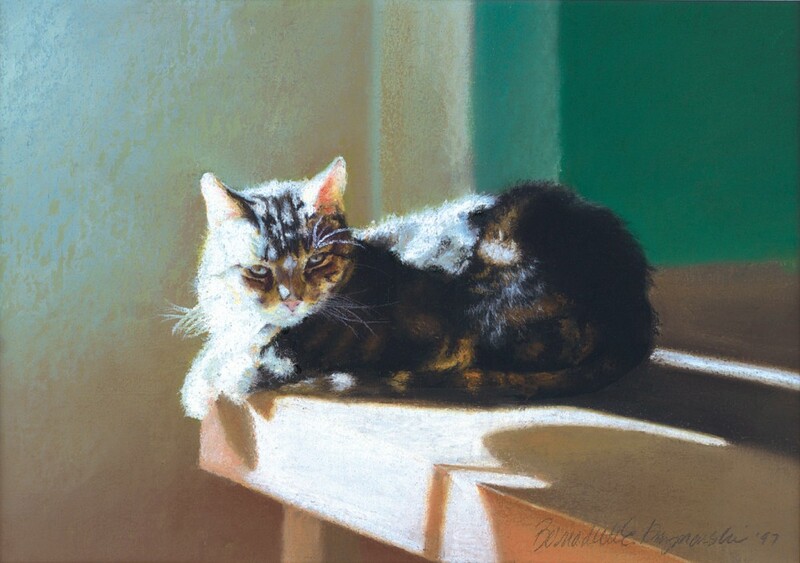 I did get back to painting cats, though I began with one that was not my own, only a nice photo from a calendar, and I worked in watercolor for this, in part because I wanted to practice it a little more and wanted to ease myself back into the familiarity of what painting had been like before my two losses. “A Few of My Favorite Things” is still one of my favorites, and though at the time many people created artwork from published photos, it’s not an acceptable practice today. I sold this painting long ago, but I will never reproduce it for sale, and will only show it as an example of my art. And I enjoyed listening to music, but still felt the emptiness of my house. I discovered recorded books, beginning with as many of James Herriott’s books; the listening and the stories themselves were a balm to my heart as the months passed and I adjusted to the new household. Now, when I look through my artwork and see these paintings I always remember those days and the gift I was given to fill the emptiness left by my losses. These paintings will always be special for me, always connected to Kublai and Allegro and that time in my life, in ways no one would guess while they look at landscapes. The following year on October 3, Namir and Kelly arrived as fosters, my gifts, perhaps, for a successful lesson learned in art, grieving, and love. Two of these paintings are still available as originals, “Autumn Harvest” and “The Last Bale”. I sold the other two before I had the chance to take adequate photos of them and so can’t even make prints, but I have their images forever in my portfolio, and forever in my heart. 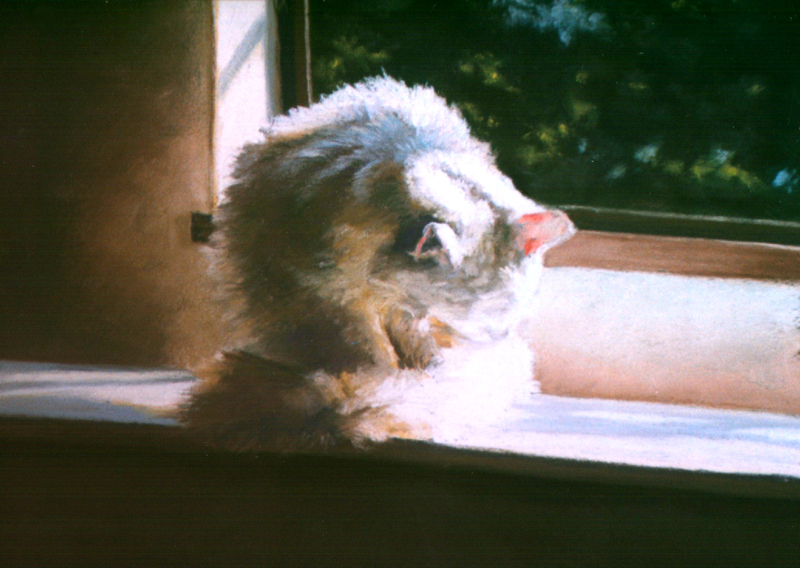 See images of more paintings of My Cats. See images more of my Landscape Paintings, and also visit my website to see other artwork. Lessons in living, loving and loss – and finding the gift in everything. Thanks for sharing Bernadette! Vicki, it’s really made me who I am as an artist. That’s why I write about it so often. Your writing and art work are so beautiful, both “painting” a creative and amazing setting. I feel every time I lose a close bond, pet or person, that if I just let myself work things out and just be, that I am able to come out the other side better. I recently came up with a business idea, because of the passing of my sweet sweet baby, Samantha. I feel she can always be with me this way. If it weren’t for the time spent alone and allowing myself to do whatever it was I needed to do, I would have never came up with the idea. Linette, these are gifts they give you in return for your love and devotion, and for lovingly letting them go as you grieve. I hope the business turns out well!